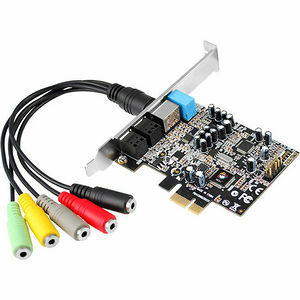 SIIG's DP SoundWave 7.1 PCIe enhances your desktop computer's audio performance to high-definition 7.1 surround sound quality. It supports audio output up to 192K sampling rate, high resolution 24bit PCM Codec, and optical SPDIF output for audio expansion. This dual-profile 7.1 channel PCIe adapter can be installed in either standard height or low profile chassis with the included bracket. It the most cost-effective solution to upgrade your existing audio capability to high-definition 7.1 channel, bringing amazing surround sound quality for better music, movie and gaming experiences from your system.